How romantic, if even now, we can hear the dying voice of a star which heralded the Christian era. 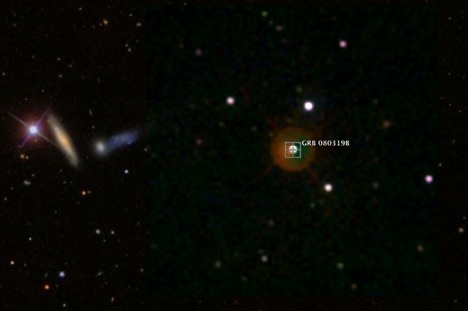 GRB 080319B’s optical afterglow was 2.5 million times more luminous than the most luminous supernova ever recorded, making it the most intrinsically bright object ever observed by humans in the universe. The most distant previous object that could have been seen by the naked eye is the nearby galaxy M33, a relatively short 2.9 million light-years from Earth. And why was this one so frakkin’ bright? Was it a more energetic explosion itself, or were we, by coincidence, looking precisely down the center of the beam? If the beam of a GRB is pointed ever-so-slightly away from us, so that the edge nicks us, the GRB will look fainter. By staring down the throat of a GRB we’d see it as bright as it could possibly be. Maybe GRB080319B had us dead in its sights. Clarke, a famous atheist, would never have mistaken a coincidence to be a meaningful event, but surely he too would have smiled at an alignment between his life, the Earth’s current location in the universe and an event that occurred half-way back to the big bang. Here’s a series of time-lapse observations that show the burst occurring (check out frame 97-98), courtesy of the real-time data processing team “Pi of the sky”. NASA’s Swift satellite took a higher resolution image showing visible light. Both the Pi and the Swift images are available online, though no-one has turned them into a KML overlay for a more immersive view. Viewed by themselves in isolation, it is hard to get a sense of the scale involved; anchored onto Google Sky, it all comes together. Notice UGC 9350 nearby? So I made this KMZ file. 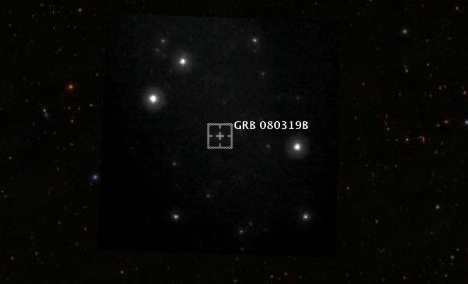 It contains a highly accurate placemark for GRB 080319B as well as two positioned overlays, from “Pi of the sky” and Swift. It helps to turn on and off each layer in turn, and also play with the opacity slider. One of the best Posts in this Blog here..